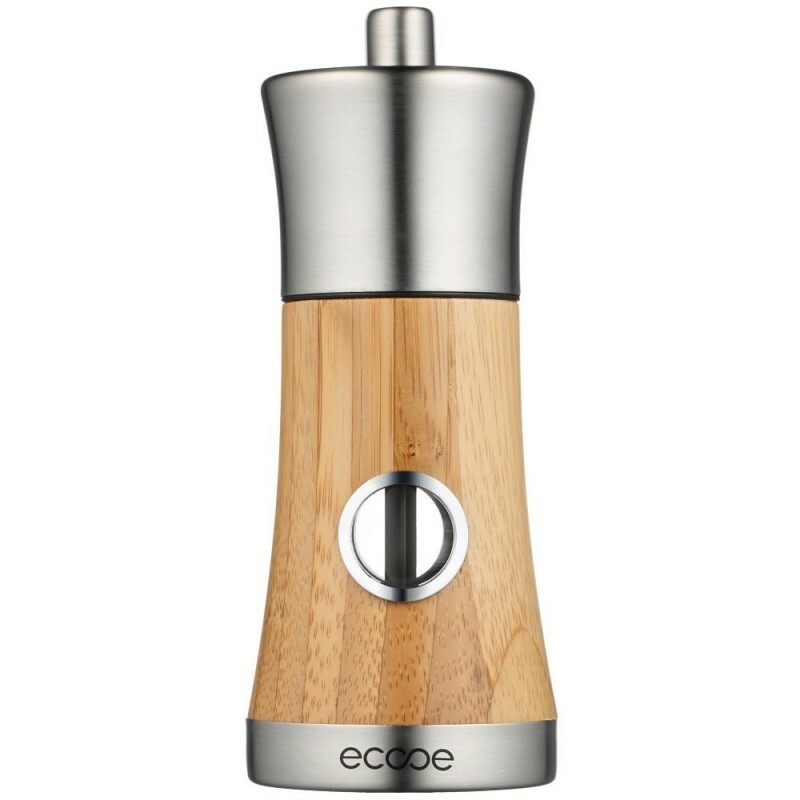 We choose organically grown bamboo and superior stainless steel to build this salt and pepper mill. It is sure to last for years given care and will be an attractive addition to your kitchen counter. 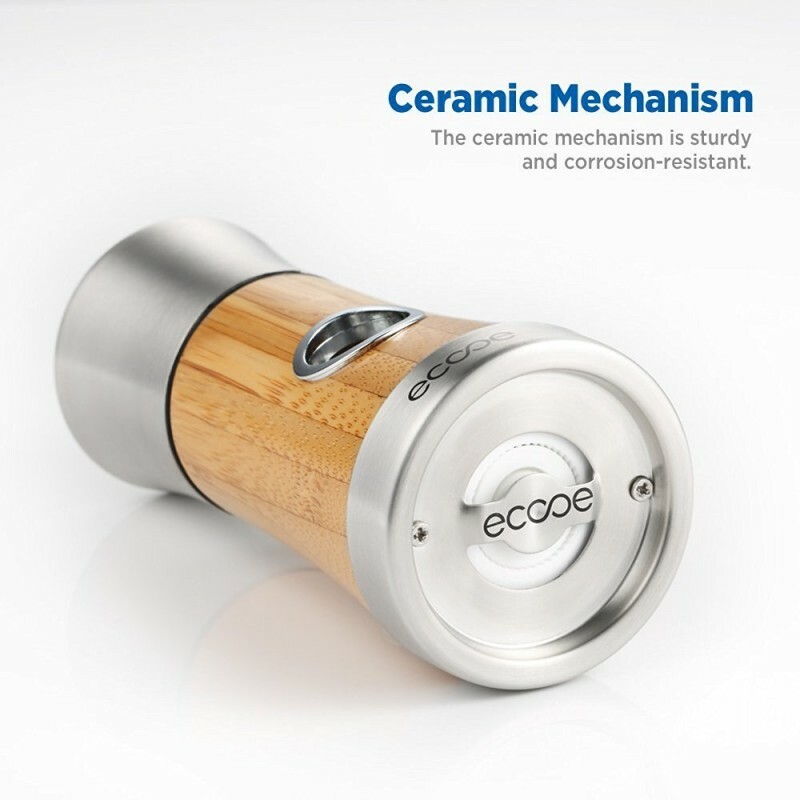 Being made sturdy and flexible, the ceramic grinding mechanism will keep working smoothly with proper care. And the freshly grinding pepper gives a stronger taste than the pepper powder — a little secret of delicious meals. 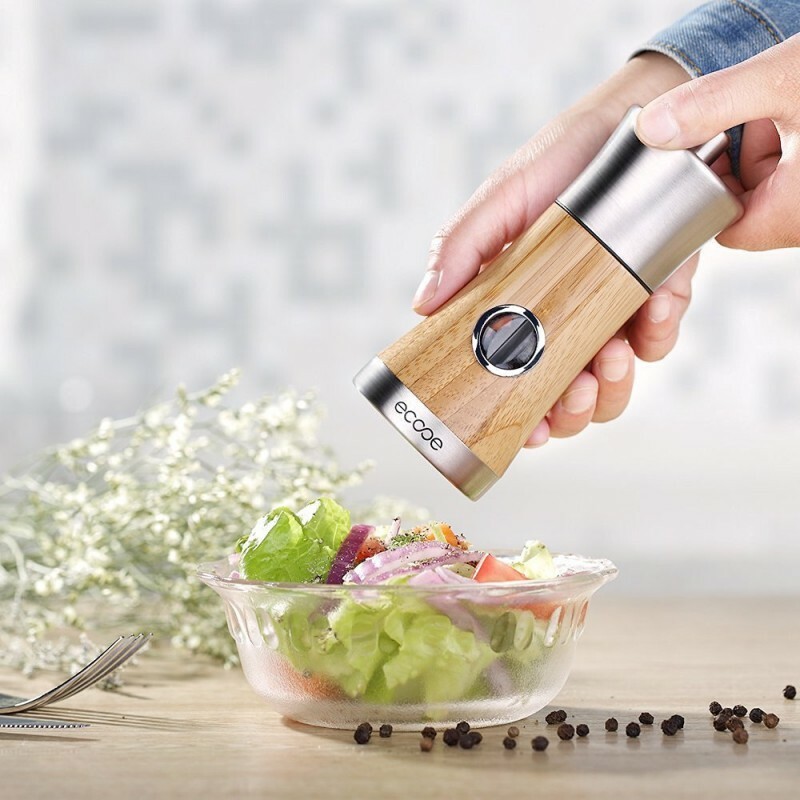 This is a great pepper grinder. Easy to do and gives a nice sized flake from the grind. Seems good quality as well. It was just what I expected, and it arrived in a timely manner. I read some reviews that rated this less than great but I love it. Maybe the one I got was better but I am completely happy with my purchase. Broke the moment we opened it. We bought two of these. One fell apart the moment we opened it. We are affraid to open the second one. The return time window closed on us. UPDATE; the company read my review and sent a replacement. It shows this company stands behind their products. The replacement works as expected. Thank you! It is the perfect grind. I bought this for my Himalayan pink salt. It is the perfect grind. The pepper grinder is decent. The bamboo isn't flush with the little window to see the peppercorns but I guess that's ok.
Bought as a gift - item was as described and arrived fast! Lovely design and very functional. I only would like it to be a little bigger. I love my pepper mill. It grinds perfectly. I don't like a big chunks of peppercorn...this grinds it to a fine powder, thereby coating the dish thoroughly. This is a nice looking grinder and works well enough that it's not worth the hassle to return, but part of me wishes I would have returned it. I use it for grinding pepper and the amount of pepper this disperses with each grind is TINY. This would work well for putting on the table to add a little pepper to personal plates I suppose. However, for cooking this is a big hassle. It literally takes a hundred turns (I counted) to spice up 4 cups of vegetables. The plastic grinders from Trader Joes work a lot better but I don't really like using plastic as I feel like it degrades over time. In summary, this grinder looks nice but just doesn't have a decent enough output of pepper for my taste. Absolutely love these. There a little smaller then expected but then that's kinda my fault for to paying closer attention to the item description. They look nice and the bamboo have a solid good feel. Stainless steal seems a bit cheap but what doesn't these days. Love this but smaller than I hoped. The grinder if very nice looking. It's a bit on the small side, which is annoying when filling, but that's not a big deal. My only real issue is that it's a very fine grind that takes a long time. I'm using it for pepper and need one for salt too, but will try another one. 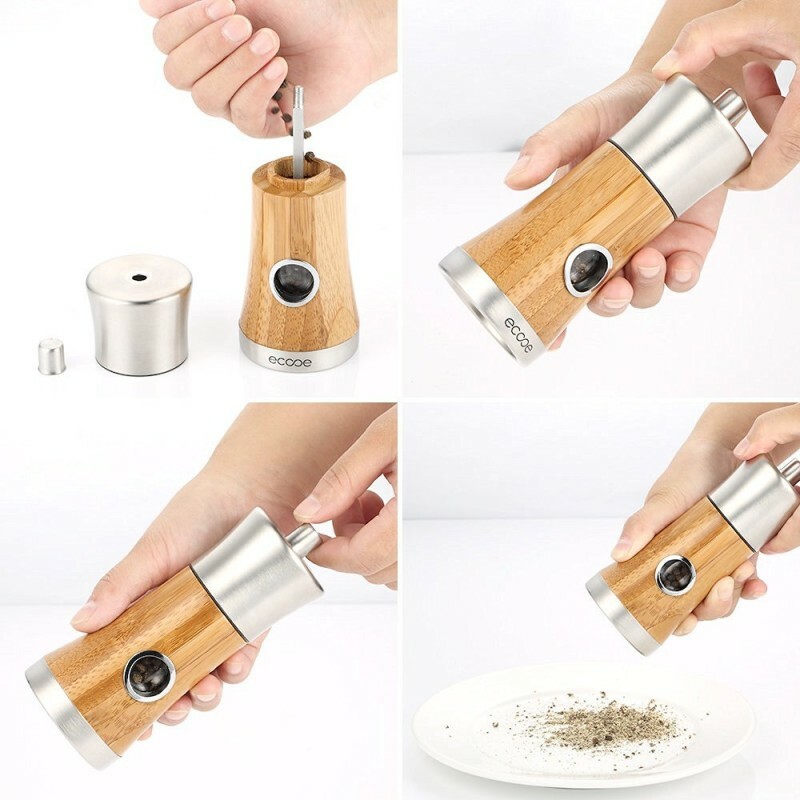 I love this pepper grinder. It looks great, matching other bamboo kitchen tools. 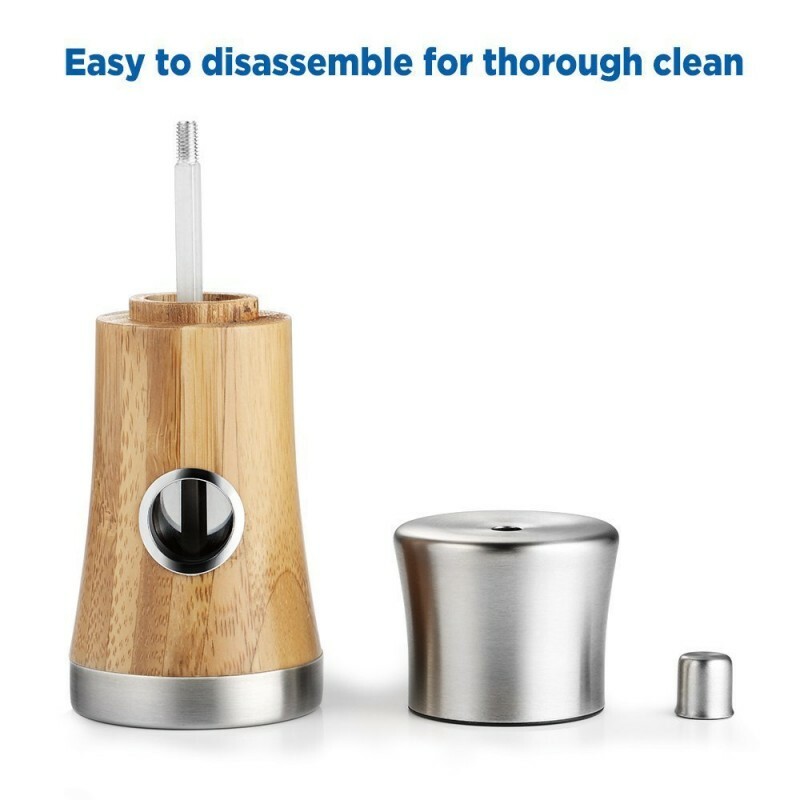 It also cleans easily and is a good size. I was dubious because I had never heard of the company before, but certainly an excellent bang for buck choice. My only negative is that the adjustment for coarseness is from the top nut, so if you want a coarse setting you leave it slightly unscrewed, which can change a bit over time. Other then that its great. This is just what I was looking for in a pepper grinder. It feels nice in my hand and does a good job grinding. So far so good! I ordered two...one for salt and one for pepper. I received them yesterday in perfect condition. They are just what I was looking for. They are a perfect size and work extremely well. Great product for a great price. I'm very happy with this purchase. The best thing in the world!its a lifesaver and its really handy for regular use. Its a genius invention and i like how high quality the product is! I like how its affordable and its simple and also easy to use.